Copyright Japan Meteorological Agency All Rights Reserved. 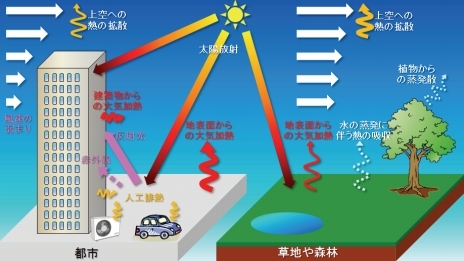 The Japan Meteorological Agency (JMA) released on July 1, 2013, Heat Island Monitoring Report 2012, which is based on the results of a study on elevated temperatures and other effects of urbanization in the Kanto region where Tokyo metropolis is located and major cities in Japan. JMA has issued the report annually since 2004 and has published. The monthly mean temperatures for August in Japan's major cities have risen at a rate of about 2 to 2.5 degrees Celsius per century due to the urban heat island (UHI) effect and global warming. The intensity and geographic extent of the UHI effect have gradually changed with the long-term advancement of urbanization, but also vary according to sunlight, wind direction, and other weather conditions. In the study, JMA evaluated UHI effects on temperatures under August weather conditions in each year from 2009 to 2012 using an urban climate model. The results showed that in August of 2010 and 2012, when temperatures were high in the Kanto region , UHI effects were particularly strong in inland areas in addition to there being a strong Pacific anticyclone. Factors thought to have contributed to stronger UHI effects include longer sunshine duration and southerly winds, the velocity of which was weakened by the presence of urban areas on the coast and therefore resulted in a reduced moderating effect of sea breezes on rising temperatures.